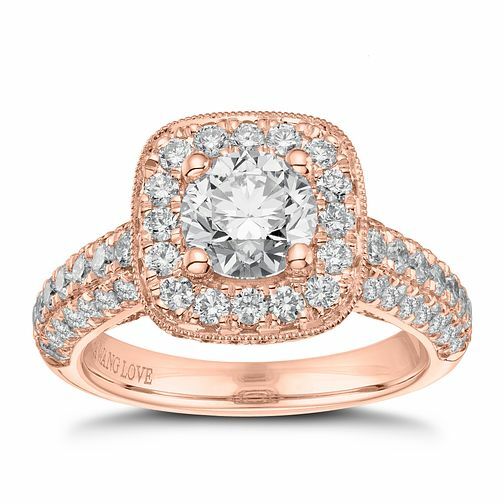 As the piece to earn the affections and desires of everyone, this luxurious statement ring from Vera Wang features a total of 2.45ct of glittering diamonds that surround the 18ct rose gold frame on almost every section. The large centre stone sits at the top with incredible sparkle and is only embellished further by pavé set diamonds that sit on the shoulders and on the shank that create an incredible glittering texture when viewed from above. As a piece designed for those with the most opulent of tastes, Vera Wang's signature blue sapphire sits underneath the centre stone, a brilliant symbolic gesture of how love can capture the heart. Enjoy the assurance of having a ring that was created with years of experience in high fashion.